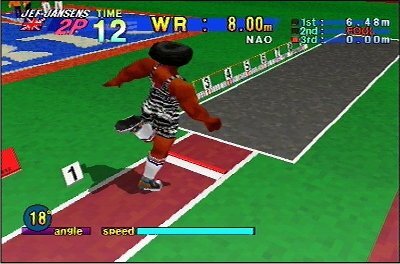 Back in the old days of Arcade action, there was a hugely popular title by the name of “Track and Field”. A simple enough concept, re-enact the energetic exertion of Olympic-standard athletics by means of mashing buttons as fast as you can, attempting to qualify to move on through a sequence of “popular” events. Simple graphics, simple concept, simple fun. Simple, eh? 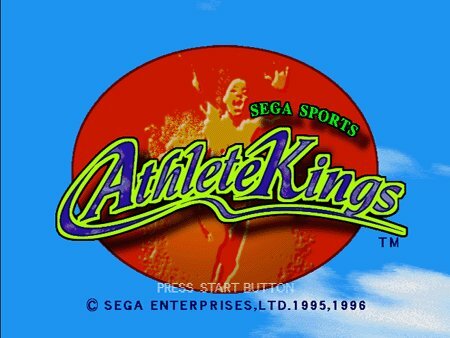 Fast forward a decade and a bit, and the concept receives a new lease of life… a coin-op by the name of “Decathlete”, and the Saturn conversion by the name of “Athlete Kings”. Introducing a selection of athletes to choose from for starters, they all have their own strengths to draw on in the different events. 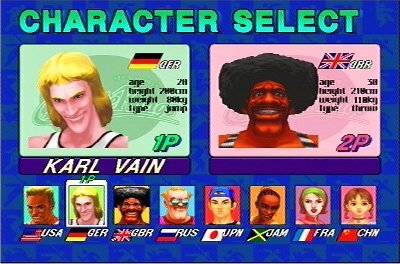 American Rick Blade and Japanese Joe Kudou fill in as “All rounders”, the Brit, Jef Jansens (hilariously named “Robin Banks” in the arcade version) and Russian Aleksi Rigel as the throwing specialists, Karl Vain, the German jumping specialist, and then the women, Ellen Reggiani, Femi Kadiena and the chinese teenager who is amazing at running but has the most forgettable name in the world. 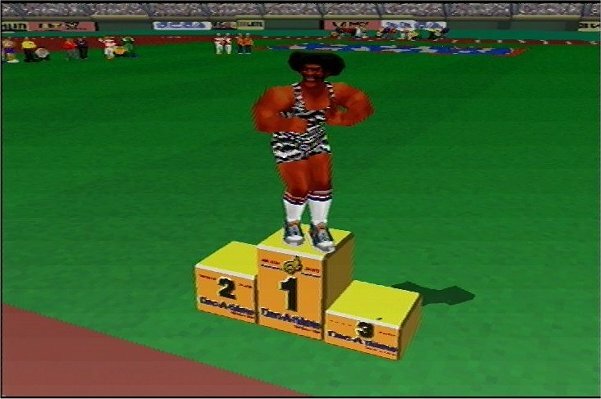 Anyway, the events are all as you would expect in a game like this, and they take on the form of the traditional Olympic Decathlon. 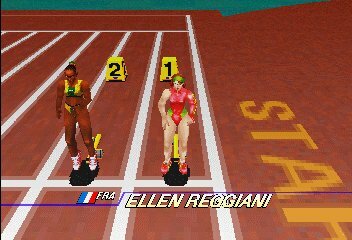 The 100m sprint and the 110m Hurdles are short but intense button-bashing races, the hurdles being interjected with occasional presses of the action button to jump said wooden barriers. The 400m and 1500m races are a little more leisurely, simply because you have to watch your stamina. The Long Jump, High Jump, Pole Vault and Javelin are all about button bashing to power up, and then good timing with the action button to set angles, extend legs and plant poles. 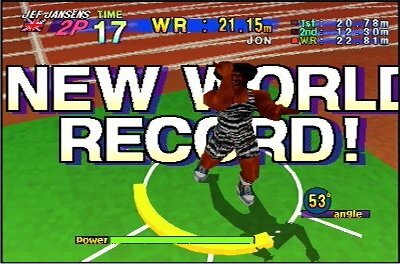 The Shot Putt is all about timing alone, unless you use the “spinning” method, whereby you can increase the power using a circular motion on the joypad, the same method you must employ for the Discus event. Whether alone or against friends, the game provides ample challenge, with tight qualification targets in arcade mode, and the honest, simple multiplayer fun, this is one of the best of the genre. The simple truth is, this game has been one of the prides of my collection, so this doesn’t just get a recommendation, it’s a “Game to Play Before You Die”.